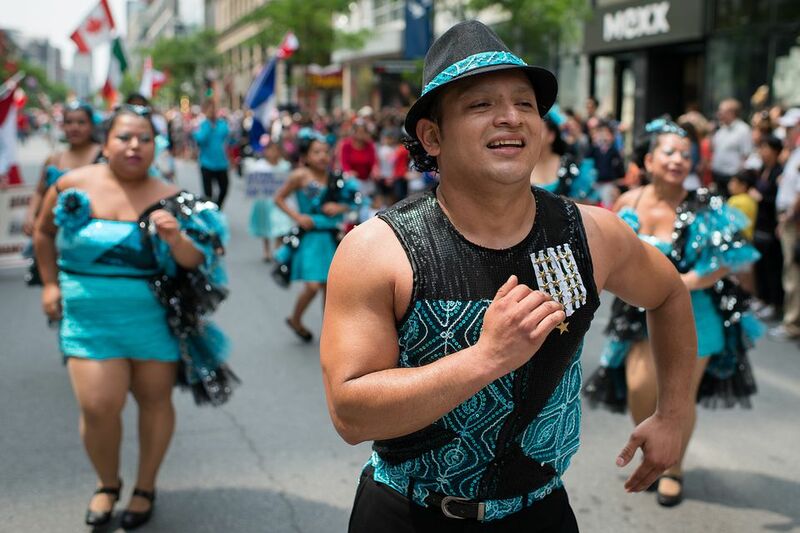 Canada Day Parade in Montreal 2018: "It is Mambo time!" I went to the Canada Day parade from Fort Street to Dominion Square, Montreal, where there were thousands of pieces of free birthday cake dished out by a crew of mostly Latinos and Caribbeans with security team of Haitians. The clients evident were Chinese, Filipino, Muslims with hijabs and American tourists with cameras. The parade was a quarter or more Chinese complete with dragons, representing communist order and ethnic regions. The rest was from dozens of countries around the world each waving their flag and proudly sporting their costumes, music and dances. Here are some videos by Chinese/Asians proudly showcasing their Culture. The image below is taken from the "The Official Website of Jimmy Chan" where he basically brags (in 2016) about how "Canada Day" is now "Chinese Day". There were even Turks waving the Turkish flag wearing Ottoman fezzes, pretending to be Shriners..?! There were Iranians sporting their flag with lion of imperial Persian empire. There was one small authentic French Canadian band with Kiwanis and real quad-4-wheeler Shriners giving Canadian participation of less than 10% of the show. I did notice most of the Montreal police were Canadian, many stayed in their car, police cadets were on some street corners. The parade should have been called United Nations Day or Mass Migration Day — nothing to do with Canada. 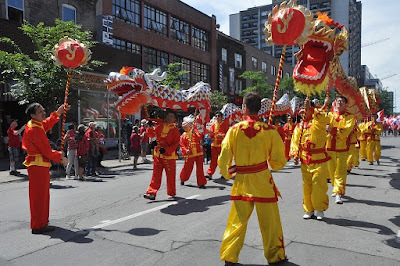 Here are some video clips of the Montreal parade this year 2018 taken by foreigners implicitly claiming they now own Canada and that July 1st is their Day, for the benefit of their race and culture against "racist" Canadians. Thirty years ago when the Canada Day parade was for Canadians it would have had school, college bands representing education and military groups; army, air, marine bands representing security; hospital/ health care facilities; church; larger iconic national businesses such as hydro, manufacturing, telecommunications, transport: rail, automotive, aerospace; mining/ smelting, banking; athletic/ sports; culture such as Cirque du soleil, Montreal symphony, country and folk; indigenous peoples. The true essence of national pride. Today Canada has none of these to celebrate. Only third world multiculturalism. For the founding European culture: pioneers, nation builders and defenders of the "true north strong and free" — it must be a sad day. The government vision and plan for the rapid and dramatic transformation of Canada from an English/ French bi-cultural country to a multicultural post nation has taken place. It's a gamble Canada will loose. It already feels now to be a country lost. What I see is a bunch of foreign powers vying for control in the vacuum of what was once a country. Here are some videos of past Canada Day parades before the imposition of Diversity. These videos are now extremely rare in the internet. It looks like the diversity commissars are deleting them from the historical record.